By Alexandr Dugin – The protests in France, symbolized by yellow vests, cover an increasingly large part of society. Political experts have already called this movement a “new revolution”. The scale of the “yellow vest” movement is already so serious that it is absolutely necessary to analyze this phenomenon in a detailed way. We are dealing with a vivid manifestation of modern European populism. The meaning of populism as a phenomenon rising from the political structure in the societies formed in the wake of the Great French Revolution, and based on the confrontation between right and left, are changing radically. Populist movements reject this classical political left/right scheme and do not follow any strict ideological attitudes, either right or left. This is the strength and success of populism: it does not play by the preset rules. Nevertheless, populism has its own logic: for all its spontaneity, it is quite possible to trace some logic and even the beginnings of a populist ideology taking shape before our eyes. First of all, the fact that populist movements are directed against the political elite as a whole, without making a distinction, whether it is right or left-wing, is striking. This is the ‘uprising of the periphery of society against its center’. In his famous work, the American sociologist Christopher Lasch (1932–1994) designated the form of government that prevails in modern Western society as the “elite revolution”. At the beginning of the 20th century, it was customary to follow José Ortega y Gasset’s discourse about the “revolt of the masses”, whose increasing influence on politics threatened, it seemed, to destroy Western culture – the European Logos. But Christopher Lasch noted a new political trend: it is the elites that are destroying culture and European Logos today. These new western elites, who have reached the pinnacle of power only by their resourcefulness and immense will to power, are much worse and more destructive than the masses. An ordinary person still maintains some cultural traditions; it is almost impossible to find a “pure proletarian”. But the modern capitalist elites, who have no aristocratism in their senses, are greedy for power, position and comfort. At the same time, more and more marginal types began to penetrate into the “new elite”, people not from peripheral groups, but from minority groups — ethnic, cultural, religious (often sectarians) and sexual — became dominant among them. It is this perverted rabble, according to Christopher Lasch, that forms the basis of the modern globalist elite, which destroys the foundations of civilization. Accordingly, populism – including the populism of the “yellow vests” – can be viewed as a retaliatory uprising of the people against the elites, who have completely lost their connection with society. The elites have built their own world in which double standards, norms of political correctness, liberal demagogy reign. According to these “new elites”, the people and society, in their current state, have no place in this world. Therefore, the typical representative of the “new elite”, Hillary Clinton, upset by the success of the right-wing populist Trump, openly insulted ordinary Americans – as deplorables, which in meaning means “shameful.” “Deplorables” have chosen Trump – not because they loved him, but to respond to the “globalist witch” Clinton. Macron is a representative of the same type of “new elite”. It is curious that on the eve of the elections the French newspaper ‘Libération’ published the headline ‘Faites ce que vous voulez, mais votez Macron ‘ (“Do what you want, but vote for Macron”). This is an obvious paraphrase of Aleister Crowley, who proclaimed himself in the 20th century as the Antichrist and the Beast 666: “Do what thou wilt shall be the whole of the Law”. In other words, obedient crowds should vote for Macron not for some rational reasons, not because of his ideas and virtues, but simply because this is the imperative law of the ruling elite. And the disregard of the elites towards the obedient, slain masses is so open that they do not even bother to seduce them with impracticable promises: “Vote for Macron, because this is an order and this is not discussed.” Vote and then you are free. Otherwise you are deplorables. And that’s all. In Italy, where half of the population voted for right-wing populists of ‘Lega’, and the second half – for left-wing populists from the ‘Cinque stelli’ (5 Star Movement – ed., Flores), and together these parties managed to create the first populist government in European history. The “yellow vests” rebelled against Macron as against the ruling liberal elite. But today, it is already no longer a movement of the classical right or left. Macron is left in support of migration, protection of minorities, the legalization of degeneracy and so-called “cultural Marxism,” but right (liberal right) in terms of the economy, firmly defending the interests of big business and European bureaucracy. He is a pure globalist, not disdaining a direct declaration of his belonging to Freemasonry (his famous hand-sign, representing a triangle), even with direct satanic slogans: “Do what you want, vote for Macron.” The revolt of ‘yellow vests’ is precisely against this combination of liberal right and liberal left. If Mélenchon and Marine Le Pen cannot be united politically, being one – too left and the other – too right, then the ‘yellow vests’ will do it instead of the political leaders seeking to lead a populist movement. The “yellow vests” are not just against economic policy or immigration — they are against Macron as a symbol of the whole system, against globalism, against liberal totalitarianism, against the “existing state of affairs”. The “yellow vest” movement is a populist and popular revolution. And the word “people” (populus, ‘le peuple’) in the concept of “populism” must be understood literally. Aleksandr Gelyevich Dugin is a Russian philosopher, political analyst, and geostrategist, and author – best known internationally for his book ‘The Fourth Political Theory’. He has close ties with the Kremlin and the Russian military, having served as an advisor to State Duma speaker Gennadiy Seleznyov and key member of the ruling United Russia party Sergei Naryshkin. He resides in Moscow, supervises the work of Geopolitika, and inspires the work of the Eurasian Movement. Translated from Russian (RT) by Geopolitika minor edits by J. Flores for FRN. Long story short; French citizens have revolted for the fourth week in a row calling for changes in governmental and corporate design. Even though UN Military and thousands of French police have been deployed in response, the police have actually been filmed removing their helmets in solidarity with the French people. In this light, all police, military personnel, teachers, doctors, social workers, academics, journalists, bureaucrats, politicians and other people who work within the system (as well as everyone else) should attempt to truly understand what this increasingly global movement is actually about and stand with the people who are attempting to facilitate genuine change in our troubled world. Moving on, the mainstream media have generally limited their reporting on the demands of the ‘Gilets Jaunes’ (Yellow Vests) to a rejection of a fuel tax, raising the minimum wage and the removal of the Prime Minister, Emmanuel Macron. And of course there’s been a disproportionate focus on looting and other ‘uncivil’ behaviour. However, the independent media is telling a more comprehensive story than the mainstream platforms, which comes as no surprise. After all, ‘fake news’ isn’t just false reporting, it’s also the dishonest dissemination of information such as lying by omission. To make it clear, the protests are now also about pro-nationalism and anti-globalism, as well as ‘Frexit’ (the French exit from the European Union). They also reject the propaganda of the mainstream media, debt owed to the EU, austerity in general and the ill-conceived carbon tax. However, it didn’t start off that way. The Yellow Vest Movement (YVM) did arise from a rejection of the fuel tax, but after Macron more or less offended the entire nation by calling them ‘thugs’ it was the straw that broke the camel’s back for the French. This saw the wave grow into tens if not hundreds of thousands of dissenters, which is now being referred to as the ‘French revolution 2.0’. We should not just admire, but learn from the French’s rich history of activism and their current application of it. To be fair though, there’s the good, the bad and the ugly with the YVM. They want real change for the good, which is the good. The bad is that they haven’t yet identified the key priorities required for real systemic change. The ugly is the looting – which violates the Non-Aggression Principle (NAP) – and other counter-productive behaviour. Moreover, during the past month the YVM has spread to many other European countries, including Belgium, the Netherlands, Germany, Sweden, Italy, Poland and Serbia. It’s also beginning to spread to the US, Canada, Australia and New Zealand, and even the Middle East. As it continues to grow across the world, as is argued below it needs to be done with a clear, universal focus to actualise real, systemic change. Larger lists have emerged which may not necessarily represent all of the French revolutionists, but there’s some really well-thought-out demands here which help them not just as a whole, but different demographics too (including the homeless and the police). It’s actually very civil. And that’s definitely a requirement in their rebellion; if you don’t have an agreed message that is reasonable in the context of your cultural standards then no amount of street activism will have the desired effect. Many people around the world feel in similar ways too, hence the expansion of the YVM. Moreover, it’s not just the ‘conspiratorial subculture’ who believes there’s really big flaws with the design of our governments (including how they’ve allowed private stakeholders to monopolise banks and industry at the public’s expense); it spreads right throughout the masses too. For example, the older generations have been aware of the corruption and lies for decades. The younger generations are ‘woking’ themselves, even if it’s generally coupled with a narrow or misguided focus. And then of course there’s a large, penetrating group of deeply inspired and passionate people of all ages who have peered beyond the veil of officialdom and therefore see the world through a larger lens. Yet, there isn’t a coherent agreement among the people. Sure, huge proportions of the population reject the way things work in different ways, but the problems and therefore solutions are different according to each person you talk with. ​We CAN capture the general vibe though; populist dissent is against the political and corporate elite. In other words we have a corporatocracy, not a democracy. Let that sink in properly for a moment. Therefore, as I’ve written several times before, if we want real change within our social system we need to focus on the 4M’s, which are Money (banking and finance), Medicine (prescriptive and preventative practice, including food), Management (education and government policy) and Media (informed choice and authentic public discourse). I’ll elaborate on this a little later. Decentralisation (meaning all services from government and otherwise should be locally organised). Media: all media monopolies are dismantled so that a plurality of opinions and authentic investigative journalism is accessible to all citizens. If real change is to occur, we ALL need to demand these changes no matter where we live. For those who don’t understand the money and banking issue, please read this example of what a publicly owned and operated central bank used to look like in Australia at the start of the Twentieth Century. And remember: there really are some fundamental problems AND solutions that the entire world – as a real community – could put up for civil, but assertive Analysis, Agreement and Action (the 3A’s for creating societal change). That will be our key challenge as we move into a future where regardless of our perceived and real differences, we still honour our role as a human family. Resolve severe socioeconomic emergencies, such as homelessness and entrenched poverty. The immediate cessation of privatising public utilities and re-nationalisation of public infrastructure and strategic assets, like hospitals, motorways, airports, rail, farms, ports, water and power. Abolition of all taxes and replace with a transaction tax (also known as the ‘Tobin Tax’) so that all individuals and corporations contribute fairly. (In this system, all electronic transactions (including cash withdrawals) are hit with a flat fee, ensuring that all tax loopholes are closed. With the amount of money that moves around each year (especially through speculative currency exchange transactions) the calculations indicate that with a flat fee of just a few per cent, tax revenue would double or even triple current levels. Yes, it really is that much (due to the speculative spending on Wall Street and by the private banking cartels). Break up the ‘too-big-to-fail’ banks and re-separate regular banking from investment banking (with a view to creating and encouraging the public use of public banks). Thorough independent investigations into government and corporate corruption, human trafficking, pedophilia networks and other tragedies of our world. As alluded to, the legal system needs to be revolutionised so that it is fully aligned to individual and community sovereignty, as well as decentralisation principles. Dismantling of all monopolistic parasites, such as the corporate media, big tech, pharmaceuticals, agriculture, petro-chemicals, energy and others. Full scale independent but government supported research and analysis into psychotropic and other natural medicines, alternative energy systems and other suppressed technologies and resources. Widespread adoption of localised and regionalised permaculture systems to resolve environmental concerns, create healthy food systems and increase community sovereignty. Eliminate carcinogenic pesticides and endocrine disruptors. Education for children and adults should include a plurality of opinions, paradigm questioning, large focus on life and health skills and encouragement of cooperation and creativity. Once again the monopolised media has proven themselves to be a mouthpiece of propaganda by the powers-that-will-no-longer-be. There’s been little investigative reporting, even if some journalists are trying to get a more fair message through. The sad part however is that many of these so-called journalists actually believe the dirty deception that they spray out of their germ-filled mouths. But back to the story. I want to make this super clear: the above is simply a series of suggestions to invoke further exploration and discussion. I really hope that it does exactly that, regardless of my own biases and shortcomings. Now the recap. The first step we need to take is to acknowledge that a huge proportion of the population want real, systemic change. That is a collective discussion we NEED to have, but is NOT an ongoing dialogue in the mainstream media (more or less anywhere in the Western World). That has to be a serious concern to any reasonable person. The next step is identifying the core issues and their potential solutions (which is the central purpose of this article). Then a full spectrum application of the 3A’s should continually occur and be reported on and facilitated by all information sources, including the mainstream platforms. So, is the YVM doing this? Unfortunately, not yet. But I’m hoping this article will encourage more individuals and groups to do so. The ironic aspect is that so many of us are screaming for real change, but when we do it without focusing on the core design flaws, then our voices might be heard, but only softly. However, if we all focused on the bigger picture – the macro policy design – then it wouldn’t just become a household song, it would result with a collective upgrade via a linguistic revolution and result with a more just and honourable social system for our future generations. And one more thing: always remember the greatest rebellion against a sick system is to take great care of your physical, psychological, emotional, philosophical and spiritual health and then radiate it to the rest of reality. This article (The Demands of the Yellow Vest Movement are Growing into Real Systemic Change) was originally created by Phillip J. Watt and is re-posted here with permission. Amazingly well informed Yellow Vest protestor calls out private bank exploitation, the Federal Reserve and what Iceland did to fix their problems in 2008. I swear, Macron should cut a little bit his cocaine consumption and stop behaving like a rich family's youngest kid. But who am I kidding, the protests will stop and within 6 months, Macron will just keep furthering his ultraliberal agenda and cut up in pieces and sell whatever sense of unity and pride the French people have left. The worst part in all of that is that a Le Pen presidency would have been worse, since the woman's just a globalist stooge who suddenly dropped all references to leaving the EU and Eurozone as soon as she had a chance to reach the second round of the elections, and would be the kind of leader Bolsonaro is: lots of nationalistic blabbering, but nothing will be done to free the national economy from the dollar, and the country will keep supporting the USA and Israel. Hence, we have de Rothschild banker Macron. This is the subtitled in English speech of a French Medical Doctor addressing his President, Mr Macron in the most frank and visceral manner, pleading him to listen to his people in distress, calling him to account for the terrible situation France is in. As Paris braces for fresh "Yellow Vest" protests after consecutive weekends of riots, FRANCE 24 reporters head out of the capital to meet protesters in rural France. In the small town of Montargis, 130 kilometres south of Paris, the Yellow Vests have set up camp at a strategic roundabout and are preparing to spend the Christmas holidays making their voices heard. FRANCE 24 takes a look at some of the reasons behind their anger. ►► On France24.com: Who are the 'Yellow Vest' protesters? The pressure will now grow to disperse the Yellow Vest movement while also attempting to use the Red Scarves to manufacture support for draconian government policies and police crackdowns aimed at finally ending the establishment-threatening protests. PARIS — As the “Yellow Vest,” or Gilet Jaunes, protest in France continues to perplex and concern the French government and European elites, a new “counter-protest” has emerged in response to the popular protest movement now entering its 12th week. 5/ A Journalist in #France got badly injured yesterday. The police officers shot a Flash ball and breaking his kneecap instantly! When they gathered at roads and roundabouts at the end of last year, the French government was caught off guard. Within a week of their first nationwide mobilisation, they were turning out regularly at intersections across the country to slow up traffic, and marching through Paris and the big provincial cities. Hasty polls announced that 70 or 80 per cent of the population, including many in France’s largest conurbations, supported this massive show of impatience. Yet the gilets jaunes first came together beyond the margins of the major cities, in rural areas and small towns with rundown services, low-wage economies and dwindling commerce. They were suspicious of the burgeoning metropolitan areas, which have done well on a diet of public funding, private investment, tourism and succulent property prices. Among them are people who grew up in city centres but can no longer afford to live in them: these barbarians know where they are when they arrive at the gates. Parading in central Paris and the new, carefully massaged hubs of French prosperity – Toulouse and Bordeaux especially – they end proceedings with a show of violence and destruction. After 15 weeks of costly protest, public sympathy in the big metropolitan areas has only recently begun to fall off. That is one of many puzzles. Another is the pace at which a provincial revolt about fuel prices and speed limits broadened into a radical rejection of Macron, the office he holds, the National Assembly and the political parties, including Marine Le Pen’s Rassemblement National – formerly the Front National – and Jean-Luc Mélenchon’s La France Insoumise. State expenditure and tax rates for rich and poor alike were also called into question: public services in the hinterlands (schools, doctors’ surgeries, childcare, care for the elderly, job creation) and local government institutions were felt to be poorly resourced and staffed, while cities flourished as immense enclaves of prosperity. On 17 November last year, a Saturday, a motorcade of bikes and cars swept down the grands boulevards in Paris. The bikers were wearing yellow hi-vis vests; you could see them in the cars as well, placed ostentatiously on the dashboard. The procession passed in less than two minutes. I was watching with a journalist from France 24, the state’s international television network, who gave a derisive shrug. But 280,000 gilets jaunes were out across France, creating go-slows at roundabouts, motorway tolls and intersections. It was a triumph; they were ready for more. On their Facebook pages they began referring to 17 November as ‘Act I’. I’d already been stopped that morning at a roundabout not far from where I live in south-west France. A small group of gilets jaunes were blocking the road, complaining first about the cost of fuel, then the cost of living, then of having to scrape by on low-paid work with nothing in hand at the end of the month, then of Macron. One called him ‘le roi Macron’: she wanted his head to roll. They were playful and serious by turns and they had a plausible case. It didn’t cross my mind that two months later, after round upon round of violent demonstrations in France’s major cities, I’d be with a group of protesters – many in their late sixties – caught between two baton charges by riot police in central Bordeaux, watching young men with jemmies prising the thick plywood panels from a bank which had taken the trouble to seal off its glass front. Or look on as a demonstrator with an aerosol can sprayed an 18th-century monument with a tweaked version of a line from the ‘Internationale’. On one venerable limestone column he wrote: ‘Nous sommes rien.’ On the other: ‘Nous voulons tout.’ Rapturous applause from a crowd of thousands. Bordeaux is a paragon of France’s spick-and-span ‘metropoles’, with their impoverished hinterlands. The press has described it as ‘the capital of the gilets jaunes’. After ‘Act II’ on 24 November the weekly protests in the city were well attended, with six or seven thousand participants at their height. The demonstrations were rowdy, carnivalesque, occasionally provocative, but they usually unfolded peaceably for most of the afternoon. Around dusk, groups of demonstrators would take the fight to the police while others left for home. These outings have ritual echoes from a long past of French contestation, but the gilets jaunes who converge on the big towns on Saturdays are thoroughly 21st-century citizens, left out in the cold by globalisation. The success of their protest depends on social media. They mobilise and reach last-minute decisions mainly on Facebook. They position themselves theatrically: giving every Saturday ‘act’ a number commits them – and everyone watching – to a weekly cliffhanger, in the style of a serial podcast or reality TV show. About one in four demonstrators in Paris, where I last tried to count (in early February), had their smartphones up, recording as they marched, chanted or struggled through a haze of tear gas. Demonstrations are produced and curated as they unfold, becoming a series of ‘scenes from a demonstration’, with hundreds of director/participants live-streaming or waiting to upload content from their phones at the end of the day. Among this vast reservoir of images is material that can be useful when demonstrators challenge the police account of a fight or an injury. And there is another distinguishing feature of the gilet jaune marches: half a century after 1968, the French police are equipped with far more dangerous ‘non-lethal’ technology, including dispersion and tear-gas grenades and a kind of ‘flash-ball’, or rubber bullet, discharged from a handheld launcher. Since Act II, ‘deterrent’ weapons in the hands of the police have produced hundreds of serious injuries, though remarkably only one death – an elderly woman in Marseille who had nothing to do with the demonstrators. By contrast, several gilets jaunes have been killed in traffic incidents during go-slows and blockades on the roads. The roads, of course, are where the story of the gilets jaunes began, more than a year ago, when the government proposed to reduce the speed limit from 90 to 80 kph on 400,000 kilometres of single carriageway in France. In the Dordogne an ‘anger’ group, which had mustered on Facebook, took to the streets of Périgueux calling for the plan to be scrapped. In other rural departments similar anger groups were on the rise. Some of the protesters wore hi-vis jackets (French law states that drivers have to have them in their vehicles). No one was calling them gilets jaunes at that stage, but the protests seemed to be the start of a focused movement with a central demand. Another demand was added last summer, when Priscillia Ludosky, a young entrepreneur with a small-scale cosmetics business, launched a petition on change.org calling for a reduction in petrol prices. Ludosky works in a built-up, peri-urban landscape (beyond the capital and the banlieues), where car travel is a necessity. She’s also a perfect fit for Macron’s vision of a new, striving France full of initiative-takers from all walks of life, including minorities: a thirty-something black Frenchwoman. By the autumn her petition was edging forward with 12,000 signatures. Then in October Jacline Mouraud, a talkative, eccentric figure from Brittany – accordionist, ectoplasm hunter and hypnotherapist – posted a video on Facebook in which she denounced the tax burden on motorists, along with speeding fines, as systematic pillage. The 80 kph law had been in force since July and dissident drivers were already destroying speed cameras. Fuel tax had risen significantly since 2017 and was set to rise again by nearly 10 cents a litre for petrol and 19 for diesel by 2022 as part of a plan to achieve an ‘ecological transition’ away from fossil fuels. Before long the number of visits to Mouraud’s Facebook page reached six million and signatures on Ludosky’s petition passed the one million mark. Eric Drouet, a lorry driver in his thirties, went on Facebook to call for a mass blockade of the roads; the call spread; similar posts appeared on other Facebook pages. Wherever you went, drivers had a hi-vis jacket on the dashboard, to signal their allegiance, or their sympathy, or as a passport through go-slows. The success of Act I must have surprised the gilets jaunes as much as it did the rest of the country. Over the next few days a leaderless movement with a handful of social media figureheads (Drouet, Ludosky and others) became a leaderless revolt against the president, the government, high taxes and low pay. The following Saturday in Paris – Act II – a crowd of thousands did their best to ransack the Champs Elysées, raising barricades, setting them alight and smashing shopfronts. Five policemen and 19 demonstrators were injured in fierce clashes; hundreds of people were taken into custody. In the rest of France nearly 160,000 gilets jaunes came out to protest. The executive was in disarray: Macron had been trying to keep a ‘Jupiterian’ distance, while the prime minister, Edouard Philippe, and various members of his cabinet were shoved forward to condemn the violence and announce that there would be no change of position on fuel tax. But the gilets jaunes now had bigger, more nebulous ambitions than the price of fuel. The time had come for Macron to take to the airwaves. A few days after the fracas on the Champs Elysées he used a speech on energy and climate change to propose a floating tax on fuel pegged to the price of crude, as Lionel Jospin had done when he was prime minister in 2002. But the gilets jaunes already had the tempo, and like many road users they were sceptical about talk of higher fuel prices in the context of reducing carbon emissions. France’s so-called ‘carbon tax’ is not a distinct component of the overall levy on fuel, so it’s impossible to know how the government will spend it. But even supposing it was a hypothecated tax, with revenues channelled to renewable energy etc, why should it be a flat levy on rich and poor alike? In the turmoil of the next two months, it became easy for their detractors to scorn the gilets jaunes as rural idiots addicted to fossil fuels. And just as easy for sympathetic commentators and green-left radicals, broadly supportive of the gilets jaunes, to call for an alignment of ‘environmental justice’ with social justice. What this meant wasn’t clear beyond the principle, which the government endorsed, that the state should ‘accompany’ less prosperous people – i.e. give them financial support – during the transition away from carbon. But increasing a universal tax on fuel proved that ‘accompanying’ poorer citizens wasn’t what it had in mind, even though in the EU – from Luxembourg, with the highest per capita carbon footprint, to Romania, with one of the lowest – prosperous consumers are far greater contributors to global warming than those with a smaller disposable income. Key questions of this kind – who pays for environmental jeopardy? – would hang just beyond the reach of the executive, the press, social media and even the gilets jaunes, once they were committed to a showdown with Macron. Dismissive of his offer to rethink the fuel tax, they were readying for Act III and a new steeliness had set in. There were probably 135,000 people on the streets (and the roads) the following Saturday, 1 December. There were also hundreds of injuries and arrests and a fatal accident at a go-slow. In Paris the Arc de Triomphe was vandalised. Astonishingly, public support appeared to hold up. Macron and the government now had their backs to the wall. Philippe had tried to open a dialogue with the gilets jaunes ahead of Act III, but there were no leaders: he managed to collar a lone gilet jaune prepared to talk to him for an hour. After the impressive turn-out on 1 December he attempted to set up another meeting between a group of ‘spokespersons’ and the heads of France’s political parties, but it was scuppered when death threats were issued on social media to some of the gilets jaunes who had agreed to take part. Leaderlessness and horizontality were non-negotiable: a charismatic gilet jaune like Eric Drouet might surface and rally the troops, but that person could not speak directly to government on behalf of any other gilet jaune. If they’d believed in leaders, delegates and representatives, after all, the gilets jaunes might still have had faith in the National Assembly, the political parties and the unions. Their suspicion of ‘mainstream’ media, TV news in particular, was also deepening (several journalists were attacked at subsequent demonstrations). The gilets jaunes spurned any narrative they weren’t in charge of, with thousands of hours of crowd-sourced uploads swelling their own radiant news bubble. They were the story and only they would tell it. This dislike of any mediation other than their own had a wild, hubristic edge: you got a sense from the slogans on the backs of their jackets and their social media posts that they would have liked to stride through any institution – from the fourth estate to the judiciary – which stood in the way of a face-to-face showdown with Macron. In a re-enactment of the women’s march on Versailles in 1789, le roi Macron would appear to the crowd and then retire from his balcony full of contrition. The crowd would then demand an audience with the queen. How much did the Sèvres dinner service Brigitte had commissioned for the Elysée Palace really cost? Was it €50,000, as palace officials claimed, or nearer €500,000, as Le Canard enchaîné had suggested? The crockery scandal had come at the same time as Macron’s ill-judged remarks about the ‘crazy amounts of dough’ draining into the benefits system. In the first week of December the executive caved in on fuel tax. Philippe announced that the rise, due in January, would be put on hold for six months. The news was greeted with contempt by the gilets jaunes and the following day word came down from the president’s office that the fuel tax hike was no longer part of the 2019 budget. Even this was not enough. A list of 42 demands, addressed to MPs, was now circulating and you had to get to number nine before fuel taxes were mentioned. The origin of the document is unclear – perhaps one gilet jaune, or a group, in a department a couple of hours from Paris – but it was soon being reproduced in the press. 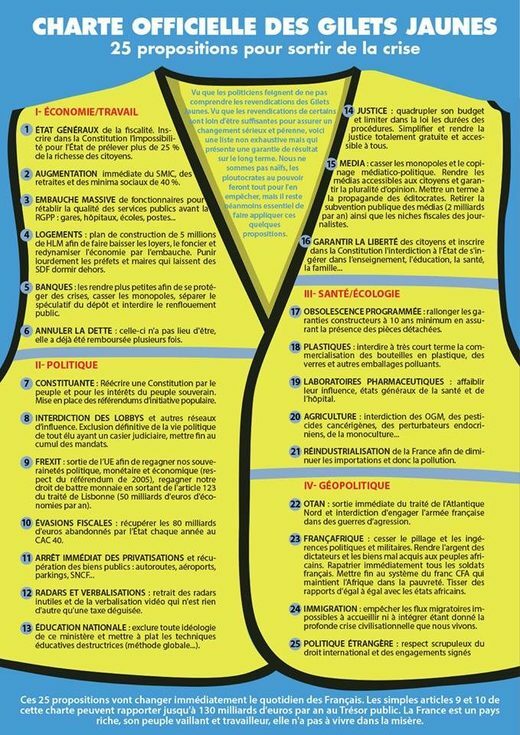 If there was antagonism from other gilets jaunes over the creation of this list of ‘People’s Directives’, at least there were no death threats. The document began with a demand for ‘zero homelessness’ and ended with a call for taxes on aviation and maritime fuel. There was a call for a ‘popular referendum’ mechanism, allowing laws to be proposed by citizens: if a proposal garnered 700,000 signatures it would go before the National Assembly and a final version would be put to the electorate. Variants of this idea were already doing the rounds: once it crystallised into a demand, known as the ‘Référendum d’initiative citoyenne’, you began to see the letters ‘RIC’ on hi-vis jackets and signs at demonstrations. The RIC would also enable the repeal of laws, moot changes to the constitution, and approve or vote down international treaties: imagine the response to a new transatlantic trade treaty modelled on the TTIP. The People’s Directives were short on ideas about revenue for the Treasury, but long on wealth redistribution, protecting French industry, caring for the elderly, bolstering rent controls, raising the minimum wage and the minimum pension, and capping monthly salaries at €15,000: the earnings gap touches a raw nerve with the gilets jaunes. The luxury goods tycoon Bernard Arnault – Dior, Louis Vuitton, Givenchy, fine champagne and cognac – alleged by the weekly magazine Marianne to make €3 million an hour, has cropped up twice in my exchanges with activists, on one occasion with a volunteer medic tending demonstrators injured by the police. She told me she earned around €1100 a month from her job as a careworker for the elderly. That’s hard to live on in France, unless you have parental support or a partner in work. Quite a few gilets jaunes work in the care sector, and as the state opts for outsourced labour, or simply lets recruitment dwindle, they can find themselves on reduced earnings in the private sector, selling their skills via agencies, which take a cut from their wages. Ultra-egalitarian sentiments are widespread among the gilets jaunes, and hard to gainsay in a country where ‘equality’ is emblematic. English Brexiteers have donned the hi-vis jacket, but their copy-cat bravado is misleading. In Britain we’re not taught equality as part of the national mantra; income inequality (higher than in France) has been offset – a little, for some – by an overall rise in property prices, at least until Brexit (wealth inequality is less pronounced than it is in France according to the OECD). The British do irony and ‘tolerance’; we have top-of-the-range costume drama and other traditions which help us to live with inequality; we like our judges and lawyers, our lord mayors and equerries, to appear in pantomime clothes on solemn occasions. Among the gilets jaunes there’s no shortage of ‘Frexit’ advocates on Saturday demonstrations, with their elaborate combination of hi-vis uniform and fancy dress. But Frexit packs a stronger egalitarian punch, based on the belief that the EU can’t allow too much social justice – a more generous minimum wage, say, waved in by a ‘populist’ administration – because that would mean contravening the rules on budget deficits laid down in the Stability and Growth Pact. There are similar left-wing objections in Britain to membership of the EU, but Lexit is a Leave fringe. And the Frexit contingent, unlike the Brexiteers, are not driven by infusions of cash and propaganda subsidised by finance barons. Macron’s bottom line is that France needs an abundance of very rich people to fund equality, but once his capitulation on fuel tax had failed to appease the gilets jaunes new concessions were in order. On 10 December he announced that a planned rise in social contributions to pensions would not go ahead. But pensioners, hit by an earlier rise, were still militant. He also announced that any end-of-year bonuses from bosses would be tax-free. (Over the next few days journalists buzzed around CEOs asking whether they were prepared to do their duty and shell out generous bonuses for their staff.) The minimum wage would go up by €100 per month, to about €1100 after deductions, although things turned out to be more complicated. A 1.8 per cent rise that was already due would be rolled up in the new offer, and that figure of €100 also included a rise in supplementary income for the low-paid. The trouble is that only around 40 per cent of people on the minimum wage are eligible for the top-up income. People were suspicious and confused. Macron, the gilet jaunes decided, was one clever banker. Whatever Frexiteers had to say, it was obvious too that he would need a nod of assent from the EU: the cost of all these concessions was likely to take the budget deficit beyond 3 per cent. In his address, Macron announced that a ‘great national debate’ was in the offing. Angry citizens would get a hearing and their grievances would be relayed to the president and National Assembly. But gilets jaunes weren’t interested in being listened to politely. Go-slows on the roads and big marches through smart city centres continued. Until mid-December the militant anger on Saturday protests was mixed with a sense of relief: people had discovered they were visible at last; and at that stage public support was strong. They had broken their resentful silence and produced a cacophony of slogans, often anti-capitalist, always anti-Macron, naively opposed to globalisation. Deafening firecrackers ensured that the crowds could be heard as well as seen. Rockets rose above the marchers with an eerie pathos, like distress flares, despite the mood of festivity. But in the run-up to the new year, there was an edge of anxiety. Numbers appeared to be falling away, and the pressing question remained: how long could the gilets jaunes go on in a blaze of negative capability, unstructured, leaderless, adamant in their rejection not just of this or that tax, or pittance earnings, but of the political order as a whole, and the economic system that sustains it? The executive had abandoned its plans on fuel, pensions and the minimum wage, but remained adamant on two key issues. Macron would not reinstate the wealth tax and Christophe Castaner, the minister of the interior, would bear down hard on public disorder. Just how hard was another source of anxiety for the gilets jaunes. Whatever they thought about violence among their own, demonstrators were being maimed and disfigured by the security forces at an alarming rate. By the time Macron made his second round of concessions, there had been roughly eighty serious injuries, some to the hands and feet from dispersion grenades and tear-gas projectiles, others to the face and eyes, from the rubber-bullet launcher known as the LBD-40: too many of the police were aiming at the head. Fear was now a factor in the Saturday protests, but outrage was greater. As the confrontations continued, the number of injuries rose. The executive held firm to its law and order stance. Castaner was already considering an ‘anti-wreckers’ bill. Among other measures, individuals could be barred from attending demonstrations. The aim was to single out troublemakers or move against people with previous form, but if you were tangled up in the crowd during a spell of violence the distinction between ‘troublemakers’ and ordinary citizens looked far from straightforward. As I saw a few weeks later in Paris, an intuitive complicity exists between heterogeneous groups of people facing off against the security forces: some were resolute black blocs; some were angry, able-bodied young who might have run at the police during Act II but marched peacefully the following week; others were much older people, fumbling with their anti-tear-gas equipment as they tried to stand their ground. Some gilets jaunes were already speaking out against spontaneous violence on their social networks and though it may have been a complicated algorithmic lie, they looked to be a majority. But by January, with seven ‘acts’ down and more to come, trying to focus on who was or wasn’t up for a fight seemed pointless as long as huge questions still hung in the air about the uprising itself. Who were the gilets jaunes? Would their non-party, ‘anti-system’ position, strangely symmetrical with Macron’s during the 2017 presidential race, turn out to reveal a predisposition – to left or right – as his had during his first year in office, when his bedrock economic liberalism became apparent? The answer to the first question was easy at first sight. A gilet jaune was probably not someone who lived in Paris or a prosperous provincial city: Montpellier, Rennes, Grenoble, Brest, Nantes, Aix-Marseille, Bordeaux, Toulouse. Many were people from small to middling rundown towns in the countryside where work, skills, traditions, thriving commerce and public funding have dried up. Others came from rustbelt communities in the north. You can also find gilets jaunes in the mosaic of villages and tiny hamlets in the back of beyond, where I live. Few of them are unemployed. People in low-paid jobs on precarious contracts, exasperated pensioners, and small-scale entrepreneurs like Priscillia Ludosky unleashed this surge of impatience, which is the reason it was easy to dismiss it, as Macron did, as a reincarnation of Pierre Poujade’s petty bourgeois tax revolt in the 1950s. But as the protest gathered pace and ambition, the comparison began to look threadbare. Long before the gilets jaunes started blocking roundabouts and motorway tolls the geographer Christophe Guilluy was working on the widening gap between the large metropoles and the ‘periphery’, ‘the forgotten land of small and medium-sized cities and rural areas, home to most of the working class’. [*] In Twilight of the Elites, which appeared in French in 2016, he tells us that this vast space holds about 60 per cent of the population. They are living out the worst effects of globalisation and represent a force ‘that threatens to overturn the existing political order’. This, he believes, is the reason ‘peripheral France’ must be ‘made to disappear from public consciousness’. As a description of gilet jaune terrain, the book was astute; it was also prescient: Guilluy had seen the anger coming, and forecast the shock it would deliver to the political system, even if it was a long way from ‘overturning’ it. He, too, is angry, especially about the ‘elites’, a word that was not in his original title, but can now be taken to apply not only to experts – he doesn’t trust the Insee, France’s bureau of statistics – but to the political class, and often simply to wealthier citizens in the major metropolitan areas. His contempt for ‘multiculturalist blather’; his mistrust of ‘anti-fascism’, which he sees as a bogus distraction from inequality; his dislike of bien-pensant intellectuals who applaud immigration (and pay a low price for a lunch prepared by Malian wage-slaves in the restaurant kitchen): all this resonates with the mistrust of the gilets jaunes for the cities and the globalist assumptions of their inhabitants. Guilluy is not a conspiracy theorist but he can sound too knowing when he hints that his peripheral French have been wilfully marginalised as part of a grand plan, or that the myth of a middle class has been kept alive as part of an elitist strategy to mask the fact that only two classes are left in France: impoverished peripherals and the ‘new urban overlords’. This kind of knowingness is common among gilets jaunes as well and they can toy with far more reckless insinuations than Guilluy’s. A high-profile figure in his early thirties, Maxime Nicolle – alias Fly Rider on social media – has hinted that the killings in Strasbourg by an Islamist gangster last December were the work of powerful forces aiming to drain support from gilet jaune mobilisations and depress the turn-out the following Saturday. Expressions of antisemitism from extremists have also risen on conspiracy thermals (Macron was a banker, he’d worked for Rothschild Bank, therefore he must be serving the interests of ‘the Jews’). All the same, Guilluy’s depiction of the gilet jaune hinterland holds up well. The question is whether his spatial distinction between poorer people scraping by in evacuated spaces and flourishing urban communities is as hard and fast as he’d like. A 2015 study by the Insee found that remote, rural communes in meridional France did indeed have high proportions of people living in poverty: as much as 24 per cent. (You’re considered poor once your standard of living falls below 50 or 60 per cent of the national average, depending on the institution counting.) But it also discovered alarming pockets of poverty in city centres, while the finding that puts the biggest strain on Guilluy’s model is that Seine-St Denis, a sprawling Parisian banlieue with large numbers of migrants or their descendants, has the highest proportion of poor inhabitants – 27 per cent – in the survey. And Seine-St Denis is not ‘peripheral France’. The banlieues were a conundrum for the press now that white people were causing trouble in the inner cities. Wasn’t rioting and violence what people in the banlieues did best, as they had in 2005 when a state of emergency was declared in several big banlieues? This was another way of asking why people of African descent hadn’t come out on the streets. Reaction in the banlieues was faintly amused, verging on cynical. Reporting for Libération in December, Ramsès Kefi heard a range of views – for instance, ‘Why should we join them when they never joined us?’ – and learned that young people who were ready to march had been discouraged by worried elders. With levels of violence running high on Saturdays there was always a chance that the security forces would come down harder on non-whites than whites. Or as Youcef Brakni put it when I met him at a demonstration in Paris in February, if young blacks behaved like the gilets jaunes in the centre of Paris, they were liable to get killed. Brakni is a spokesperson for the Truth for Adama committee, headed by Assa Traoré, whose brother Adama, a young black Frenchman, died in police custody in 2016. The committee is still campaigning to uncover the facts about his death. Its sympathies with the gilets jaunes increase in proportion to the injuries they suffer at the hands of the security forces. With white French experiencing police violence, Assa Traoré told me, the issue was out in the open and her ‘mission’ was easier. She said, as she often does, that people like her brother in the sprawling suburbs of Paris were gilets jaunes long before the name was invented. In other words, peripheral French and disadvantaged people in the banlieues have more in common than they’d thought. As for skin-colour racism among gilets jaunes – one or two incidents were by then notorious – it shouldn’t discourage support from the banlieues. Or that was Brakni’s view. You might not want your headstrong youth to come out in the place de la République, but calmer activists and intellectuals of colour should march with this predominantly white crowd in the centre of the capital. That is what supporters of Truth for Adama, black and white, have been doing. From the gilet jaune viewpoint, the big cities are not places where you go to seek out solidarity: they’re where you show your face to citizens who wouldn’t normally give you a moment’s thought. Bordeaux is a good case. Le Monde has begun to refer to this provincial ‘capital’ of the gilets jaunes as their ‘bastion’. Better to say that it’s the bastion they’re besieging symbolically in the hope of being acknowledged. They can no longer afford to buy or rent in France’s second most expensive city, with a shortage of social housing and property prices increasing by 40 per cent in the last ten years. Its well-appointed satellite towns have also seen property prices soar. I haven’t met a demonstrator in the centre of Bordeaux who actually lived there. They’re making their way from the urban margins or further afield, somewhere in Guilluy’s periphery, which in the Bordeaux region includes some of France’s wealthiest wine-growing areas. A member of the Confédération générale du travail marching with the gilets jaunes in the centre of Bordeaux first alerted me to the fact that parts of the wine-growing areas were ‘desperate’, and agricultural workers vulnerably under-unionised. At the end of the demonstration the following Saturday, as events took a violent turn, I met three marchers stuffing their hi-vis vests into their backpacks and preparing to negotiate a bristling police cordon. All three – a homeless man in his fifties and two retired women – lived an hour or more from Bordeaux. One of the women told me she’d recently worked in the vineyards of Entre-deux-mers, trimming the vines to top up her pension. She’d heard that the rate for casual work was €10 an hour. In fact it was piecework at four cents a vine. She’d left after six hours with €15 in her pocket. According to research published by the Insee in 2011, the Bordeaux hinterland has thousands living in straitened circumstances in the shadow of the great vineyards, from the tip of the Gironde estuary down through Pauillac and St-Estèphe, east through the Pomerol, and south along a ‘corridor of poverty’ as far as Agen. The initial phase of Macron’s ‘great national debate’ was supposed to wind down in mid-January, but the deadline was deferred in thousands of town halls around the country, where citizens continued to deliver their views in writing about the crisis and why they believed matters had come to a head. Near enough the original due date of 15 January, a first batch of testimonies from around five thousand small town halls in rural areas was collated by the national mayors’ association and readied for presentation to Macron, his prime minister and the presidents of the Assembly and the Senate. The gilets jaunes had already expressed scepticism about the national debate: it was surely a ruse to stop them in their tracks, a masquerade by the executive, posing in listening mode. Many said they wanted nothing to do with it. But the mayors’ introductory summary listed ‘social justice’ and ‘fiscal justice’ as the two subjects most often raised, accounting for nearly a third of the material they had received. This was fully in tune with the gilets jaunes’ concerns. The depositions were known as ‘cahiers de doléances’, after the testimonies from the three estates commissioned by Louis XVI in 1789. Eventually the texts were bundled up and sent on to the préfectures of the relevant departments; from there they went to the Bibliothèque Nationale for a massive labour of cross-referencing and indexing. If nothing else, they would be a resource for generations of social historians. Beyond that, there was no knowing how the synthesis would shape Macron’s strategy in the months to come. Perhaps it would be enough for him to say he’d heard the people out, before returning to business as usual. Yet it was the gilets jaunes, not Macron, who forced this consultation. As the sociologist Bruno Latour wrote in AOC, an online daily, they had created the ‘perfect opportunity’ for a political reappraisal in France, based – as he saw it – on the need to face up to climate change and hold the fraying line on ‘social justice’. (A flat fuel tax seemed to do one without the other, quite possibly neither.) Latour was more receptive than the gilets jaunes to Macron’s great debate: the state, he argued, was admitting that it no longer knew what to do. And he thought that the cahiers de doléances were a promising idea. If the material piling up in the BN was anything like the cahiers assembled by the Third Estate in 1789, they would contain detailed accounts of inconvenience, perceived injustices, abuse and bad environmental practice. Crucially, if participants could make careful descriptions of their circumstances, as they had in 1789, their testimony would be a good source for a state – and a society – in search of ‘workable solutions’. And if they couldn’t, well, so much for the people. Latour’s antithesis of careful description was the Brexit campaign, with its thin generalisations and underexamined grievances. On 13 January, in a ‘Letter to the French’, Macron announced a second, more ‘ample’ phase of the debate. The government opened an online platform where meetings could be proposed. Prospective convenors named the place and time, gave an idea of capacity at the venue, and what the themes would be. Four were set out in Macron’s letter: tax and public spending; the role of the state in local government and public service provision; the ‘ecological transition’; democracy and citizenship. Dozens of subtopics were suggested under each rubric. There was no mention of a possible restoration of the solidarity tax on wealth, but there was a disingenuous, populist prompt on immigration quotas. Gilet jaune reactions were decidedly chilly: did the president really believe, two months into an uprising about wealth and income disparity, that he was dealing with a bunch of chauvinist hicks? Despite this suspicion, the meetings seem to have been an astonishing success. Once a meeting was cleared and posted online, anyone could register to take part. When I started looking on the website towards the end of January, there were roughly a thousand events. By early March ten thousand had taken place or were still to come. Some are smaller than you’d imagine, others are big political events with celebrity locals and MPs from Macron’s République en Marche in attendance. Often Macron himself rolls up at carefully managed events and pitches in with all his youthful eloquence, like the improbable candidate he was when he decided to run for the presidency. I failed at my first attempt to attend an event. It was advertised to take place in a little café in Montmartre, maximum ten participants, first come, first served. I arrived early to find the café closed for refurbishment. In February a debate in Bordeaux on the ecological transition was organised by Catherine Fabre, a République en Marche MP for a constituency in the Gironde. We were roughly a hundred, including Fabre, participating ‘as a citizen’. There was a dignitary from the government – Geneviève Darrieussecq, secretary of state at the Defence Ministry – plus a moderator and two recorders. A third was solicited from the audience. We were each given two bits of coloured card, red and green. Once citizens began speaking, we should raise the green card if we were in favour, and the red if we weren’t, to give the recorders a sense of opinion in the room. Much was said – about carbon taxes, VAT exemptions for the green economy, the future of France’s nuclear energy, even the pesticides in your favourite claret – and some of it well said. Only one participant, sitting near the front, wore a yellow vest. Moments after he rose to speak dozens of red cards were fluttering like bunting. He had referred to ‘Macron’ without the polite prefix ‘monsieur’ or ‘le président’. He favoured nuclear energy; a tax on aviation fuel; and with the number of injuries at demonstrations still mounting, he called for Castaner to be replaced. More red cards flew up in dismay. Somehow a breakdown of these thousands of meetings has to be presented to the government in digestible form, along with a summary of the cahiers de doléances and the responses to an online questionnaire. With the phase of debates, real or virtual, concluding on 15 March, the next key date falls in mid-April, but there’s only a vague idea of what it portends. A report back to the people by the president no doubt, including a few hints about the new ‘pact’ between the electorate and the government, which this vast consultation is supposed to inform. It’s sure to be a difficult moment for Macron: if he’s grandiose and vague, the gilets jaunes will feel justified in their view that the debate was a way of buying time in the hope that they’d have disappeared by the spring; if he makes specific promises, he can be held to account on the streets. Gilet jaune turn-outs fell during the debate as Macron’s dismal ratings began to improve. A majority of French people approved of the debate, to Macron’s advantage. It was well organised and large numbers took part. A million people responded to the online questionnaire. Others in their tens of thousands made their way through real cities and real countryside to scheduled events. Something similar had happened in November at the first gilet jaune rallies. Part of the relief I spoke about earlier is to do with congregating in a non-virtual space that isn’t a music festival. Paradoxically, the gilet jaune obsession with recording and posting as they march has prolonged this exuberance, and helped them keep the initiative. At the end of a Saturday they find it difficult to part company. But the price has been high. Besides the elderly woman in Marseille who died after being hit by a fragment of tear-gas grenade, there have been around a dozen deaths on the roads at gilet jaune go-slows (in one the driver of a 4x4 reversed over a 63-year-old demonstrator). So far there have been no fatalities among participants in the Saturday marches. But the toll of police and civilian injuries is now in the thousands. The ‘defensive’ arsenal of the security forces is responsible for the worst damage. By early February, according to one count, four people had lost a hand, nearly two hundred had received serious head injuries, and about twenty had lost an eye. Then there’s the matter of self-inflicted harm: the pig-headedness of railing against a lower speed limit, which figures suggest is already responsible for a drop in road deaths; the destruction of speed cameras; the demonisation of Macron; the flurries of fake news and wild theories from the outer reaches of virtual space. But spasmodic racism has been far more damaging than any of these. From the incident late last year when a woman in the Paris Métro was insulted by Holocaust deniers in yellow vests, through a rash of vandalism and desecration, to the abuse hurled at Alain Finkielkraut in February (‘go back to Tel Aviv’), antisemitism has become the prevailing racist mode, but not the only one: a Muslim woman was forced to remove her hijab at a go-slow, a black MP was described on social media as ‘a fat Macronist negress, fresh out of Africa’; sporadic Arabophobe or anti-Islamic sentiments surface on social media. The national antisemitic mood is more alarming than outbursts of antisemitism among activists and marchers. According to a recent Interior Ministry report, France saw a sharp rise in antisemitic incidents (threats and acts) last year, up 74 per cent on figures for 2017. It’s worth noting that the gilets jaunes only took to the highways and cities in the last seven weeks of 2018; and that despite the rise – here is the real shock – the number of antisemitic incidents is well within the average for the last twenty years. Impossible to lay the blame at the door of the gilets jaunes. If they were an organised movement, if they had stewards at demonstrations and moderators on social media; if they had a constitution, a disciplinary code or a leadership – as the Labour Party does – then you could argue that antisemitism had infested the gilet jaune project. But until a structure emerges, if it does, this remains a spontaneous assembly of angry citizens living in work-poverty and precarity: people on the far right – the gilets jaunes have been praised by the Italian deputy prime minister, Matteo Salvini – and far left, as well as many more who march without affiliations, and wouldn’t give Marine Le Pen the time of day. The last few months have seen a ferment of commentary on the gilets jaunes. Scholars and partisans on the left have found much to hope for, including the possibility that a mass of citizens clamouring for social justice would incline, in the end, to a radical left-wing programme. For the philosopher Sandra Laugier and the sociologist Albert Ogien, writing in Libération last year, it was clear that left-wing gilets jaunes were already steering their comrades away from dangerous distractions – ‘xenophobic, homophobic, authoritarian’ – and sharpening the focus on inequality. (It’s true that the condemnation of racism by gilets jaunes themselves has been ferocious.) For Jacques Rancière, a ‘collective of equals’ had changed the day-to-day rhythms of thought and action by occupying roundabouts and motorway tolls. Time itself had been interrupted and in this unfamiliar, slow-motion world, all it had taken was a vigorous tug on a single thread – the fuel tax – for the ‘entire fabric of inequalities’ to begin unravelling. For Etienne Balibar in Mediapart, France was at a moment ‘when those at the top can no longer govern as before and those at the bottom no longer want to be governed as before’ (a paraphrase of a remark in Lenin’s ‘Collapse of the Second International’). Terrifying masques might suddenly unfold in this strange turmoil – enactments of hatred or racism – but Balibar has insisted on the generally ‘civic’ character of the uprising. There is talk now of organising and structuring. A dynamic group of gilets jaunes in Commercy, a town of six thousand people in the Meuse, has been hosting ‘an assembly of assemblies’ since January, and is responsible for some of the most articulate appeals against racism. A tentative gilet jaune list for the election to the European Parliament has fallen apart in a flurry of disputation; another is in the works, but a rush for the May elections could well be premature. And it would be strangely out of character: there’s no denying Rancière’s observation that the gilets jaunes have interfered with the clock, slowing down the pace of daily life and forcing a political hiatus. For weeks now, the humdrum work of the executive and legislature has ground to a near standstill. At last, a bill introduced by the finance minister on 6 March proposes, after the failure to agree on an EU-wide initiative, that the administration should go it alone and tax the big four – Google, Amazon, Facebook and Apple – at 3 per cent of their turnover in France, as Macron promised in December. Aside from this, Castaner’s ‘anti-wreckers’ law has been almost the only serious project in parliament for three months or more. Could matters continue like this through April, until some fanfare is sounded, followed by a speech from the Elysée about the way ahead? Gilet jaune numbers dropped again in Act XVII on 9 March. But the humiliation felt by underpaid people – careworkers are a striking example – when they hear about disproportionately high incomes is not about to disappear. Excess at the top is felt as a slight. Europe has superb codes of practice, charters, laws proscribing insults levelled at minorities, but there is no code that protects the low-paid against the endless taunting to which they’re subjected by news of lunatic salaries and bankers’ bonuses. They feel outcast, and though their numbers are high, they see themselves as a new minority with no recourse against economic discrimination. [*] Twilight of the Elites: Prosperity, the Periphery and the Future of France by Christophe Guilluy, translated by Malcolm Debevoise (Yale, 224 pp., £18.99, February, 978 0 300 23376 6).